This Power Point is designed to help teachers save time by providing them with a field tested lesson to include students with moderate/severe disabilities. Common Core Standards are provided, along with goals and benchmarks to help teachers save time and to focus the lesson. 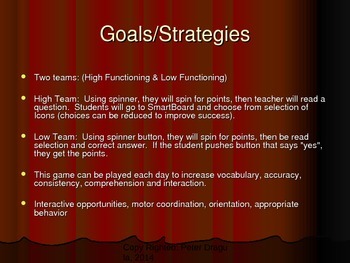 The goals are functional, pragmatic and academic for students with disabilities, as well as without. The lesson can be performed using an interactive board or be printed to provide students with an opportunity to work on simple math and social skills. Resources are provided as well for the teacher. This lesson is fine for any experienced teacher who does not have the time to create their own lesson, or for the novice teacher who is trying to understand how to meet the expectations of an inclusive setting and students with moderate/severe challenges. 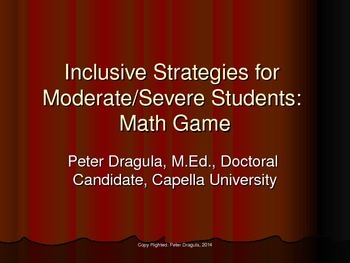 Inclusive Strategies for Moderate/Severe Students: Simple Math by Peter Dragula is licensed under a Creative Commons Attribution 3.0 Unported License. Based on a work at http://www.teacherspayteachers.com/My-Products/New/Digital-Products. Permissions beyond the scope of this license may be available at http://www.teacherspayteachers.com/My-Products/New/Digital-Products.